The Dali Universe was one of the few events where I decided the 10 euro entry fee was worth the resulting loss of food money. Profile of Time, 1977. Cast in 1984. The Dali Universe. Venice Biennale June 2011. Photos by Aditi Kulkarni. Snail and The Angel. 1977. Dalinien lantern - Octahedrom 1987. Cube 1981. Tetrahedron 1981. An interesting issue that comes up is that although the author of the work is Salvador Dali, several artisans were involved in the physical production of the various sculptures. Since their names are not listed, its important to recognize their anonymous and unmeasured contributions to the work. 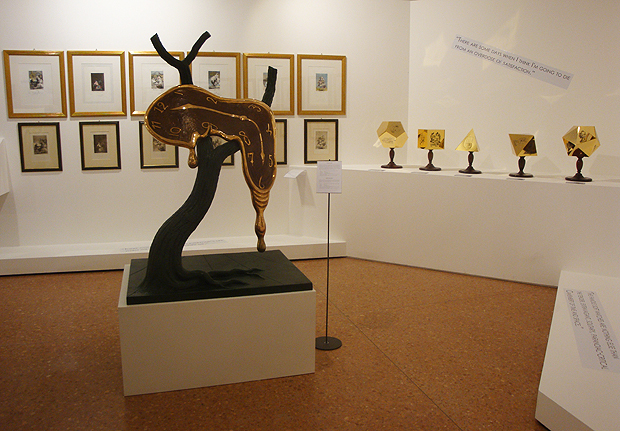 Other pieces worth noting were 'Flordali - Les Fruits', 'Poire Don Quixotte (pear) 1969' and 'Alice in Wonderland 1979-1999.' Some brilliant etchings were titled 'La Visa es Sueno 1973' but the available information was too brief. The exhibition staff here were pretty unhelpful with my barrage of questions. There could have been a language problem, I'm not sure. I also wanted a list of the all the artwork being displayed, but they didn't have that either.